For crust: In a medium bowl, combine flour, 2 tablespoons cocoa, 4 1/2 teaspoons sugar and the salt. Using a pastry blender, cut shortening into flour mixture until it resembles coarse crumbs. Sprinkle 1 tablespoon water over part of the mixture. Gently toss with a fork. Continue adding water, 1 tablespoon at a time, until all dough is moistened. Form dough into a ball. On a lightly floured surface press dough into a disk. Roll dough into a 12-inch circle. Ease circle into a 9-inch pie plate. Trim pastry to 1/2-inch beyond edge of pie plate. Fold under extra crust and crimp as desired. Prick bottom and sides of pastry with a fork. Line crust with a double layer of foil. Bake in a 425 degrees F oven for 10 minutes. Remove foil and bake for 8 minutes more or until set and dry. Remove from oven and cool completely. For filling: Place chopped chocolate and butter in a medium bowl. Set aside. Heat milk in a large heavy saucepan over medium heat until steam rises from surface (do not let boil). Meanwhile, in a medium mixing bowl, whisk together 2/3 cup sugar, the yolks, cornstarch, and 2 tablespoons cocoa powder (mixture will be thick). Slowly whisk 2 cups of the hot milk into egg mixture. Add egg mixture back into saucepan. Cook and stir until mixture comes to a boil. Cook for 30 seconds more. Pour over chopped chocolate and butter. Let stand for 3 minutes. Add vanilla; whisk until chocolate and butter are melted and mixture is smooth. Pour into cooled crust. Cover pie with plastic wrap and refrigerate for at least 4 hours or overnight until set. When ready to serve, prepare topping. In a large mixing bowl beat cream, sour cream and powdered sugar with an electric mixer on medium speed just until stiff peaks form. 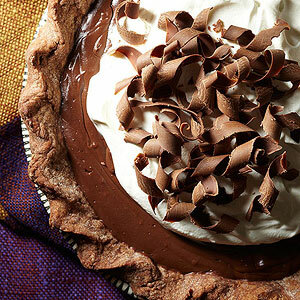 Spread over pie and top with chocolate curls.